Watercress soup seemed to be the soup of the moment in several bistros in Paris that we ate at. The first time we had it was at lunch at Table, a modern bistro close to Marché d’Aligre in the 12th arrondissemont. There wasn’t a menu to choose from – we simply had to eat what came. 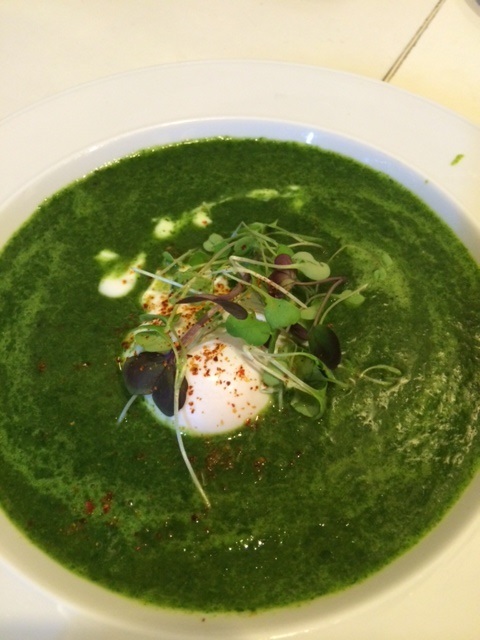 The entrée was a delicious watercress soup with a poached egg in it. Yesterday I thought I’d give it a try. I added a few leaves of sorrel but I think it would be good with parsley and chervil and also fine without any added herbs. Fresh Gardens and Jason usually have watercress every weekend. In a large pot melt the butter and a little olive oil. Add the onion and gently cook till soft (not brown). Add the watercress, spinach and herbs if using. Add the stock or water. Cover and cook for a minute or two or until the greens have wilted. Remove from the heat. Add ice cubes (about 1-2 usual size ice trays worth) to cool the mixture as quickly as possible so that the greens remain bright in colour. Blend till smooth. Season. Reheat when you’re ready to serve. Pour into bowls and add poached eggs if using. Garnish with a little crème fraiche or sour cream (optional) and microgreens.